We caught only glimpses of a shadow-like cat in the woods near our house. Shadowy kitty was so afraid of people, if he suspected someone was watching him, he would dart away, abandoning food we set out for him. Too cunning to be live-trapped, Lemmie needed help surviving the brutal winter, so we provided an insulated shelter and heating pad. I would talk to him, calling him by his name. He got used to the sound of my voice and started answering, but remained hidden. Three years passed without any progress. Then one day, he watched me fussing over our cat in the yard, and his demeanor changed dramatically. He was smart enough to realize we meant him no harm, and he came close enough that I could stroke his back with a tree branch, which he absolutely loved! That was the breakthrough we needed. 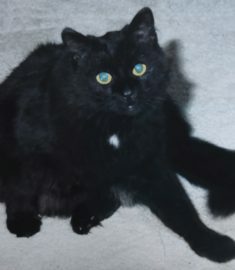 Before long, he was my snuggle buddy–the cat love of my life. We shared a psychic bond, and when cancer took him in 2005, part of me died with him. I miss my sweet boy every day. Preserving his DNA with ViaGen Pets, and knowing I could have another cat similar to him, helps ease the heartache.